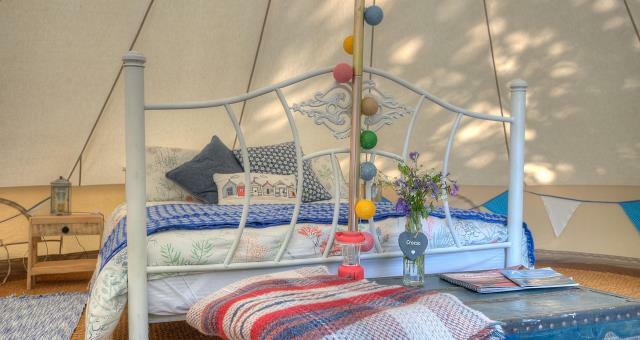 Nyth Robin glamping offers fabulous stays in our gorgeous bell tents or cost shepherds style hut. You'll find us just outside the pretty seaside village of Aberdyfi, and set in our woodlands. Our glamping offers a stay that's a home form home, so you can enjoy a holiday in the great outdoors without the great fuss! All accomodation comes lovelingly furnished with proper beds, all linen and a well equipped camp kitchen. And there's lots to do near by including great beaches, gold course, plenty of walking and a variety of tourist attractions. You'll wonder why you didn't come for longer! We have excellent shower and toilet facilities which are also shared with all guests Children welcome from age 2.